MV: Have you ever wanted to complete the Qur’an more times, but feel like it’s way to many pages? Well how about reading only 19 ayyuts a day and finish the Qur’an in a less then a year? 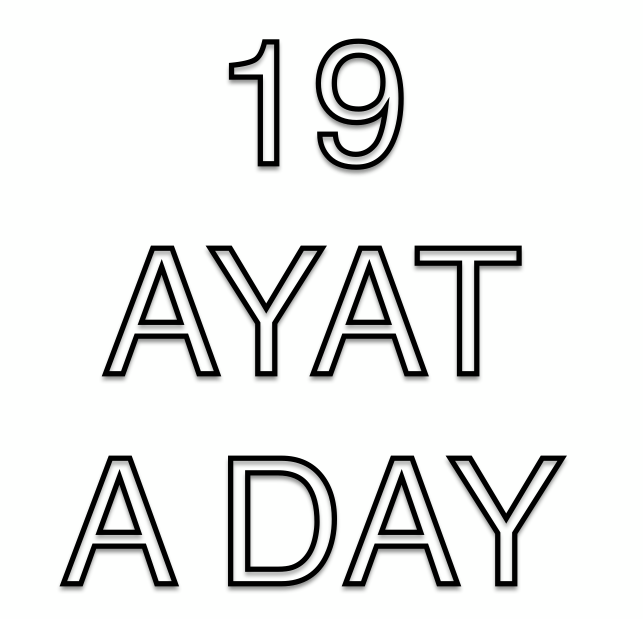 Just recently a group of brothers and have started an awesome project called, “19 Ayat A Day”, with it’s main goal of getting people around the world read read 19 ayat a day, reflect on it, keep a journal, and post your reflections. I think its a really unique and beneficial way of not only finishing the Qur’an, but also sharing and indulging on Qur’anic verses with other Muslims around the world. The project starts today, so if you want to join in the fun today is the day! Today’s 19 ayat are Surat Al-Fatiha: 1-7 and Surat Al-Baqarah: 1-12. Follow them on Twitter: @19AyatADay and share your reflections with the hashtag #19aday. May Allah swt reward them for their efforts and make us all sincerely dedicate ourselves in this project, Ameen. Watch out for our #19aday tweets on Twitter!